The distant trickle of running water, muffled conversation between guards, and her own breathing were the only sounds in Maievs cell. Only a pile of straw separated her from the hard floor as she laid with her head resting on a bent arm, facing the damp rock wall. What did you expect? she thought with a scowl of disgust. For him to grovel in gratitude and offer to make you Queen of Outland at his side? She snorted at the absurdity. Splashing footsteps approached down the partially-flooded corridor, and she quickly stood up. She refused to be seen as vulnerable or suffering. A monstrous but all too familiar figure strode into view in front of the cell door, and Maiev mustered her most withering look to greet him. Maiev Shadowsong. Fancy meeting you here." "Im surprised it took you this long to come gloat over me," she said through clenched teeth. "Sorry, Warden, but alas, I have other responsibilities now." He smiled wickedly and leaned forward against the bars. "So, once again we find ourselves on opposite sides of a jail door. Bring back any memories?" "All too many," she said quietly. "I wish I could say well have ten thousand years to make new ones, but I doubt I can evade KilJaedens wrath that long." His tone was flippant but Maiev knew him far too well to be fooled. He was terrified. She forced back a swell of pity. Im sorry things turned out like this." "Im sure you are. If you had your way Id still be locked up under Mount Hyjal." "I dont know anything anymore. So much has happened since you escaped"
"Was set free. By Tyrande." "Damn Tyrande! Does she have to enter into every conversation we have?" 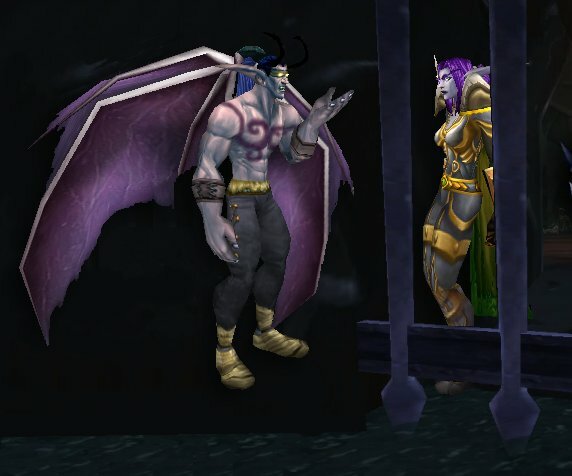 "Will you at least concede that if you were still imprisoned like in the old days, youd never have gotten involved with KilJaeden or the Scourge? Or the Skull of Guldan?" "If youll concede that if I was still in your prison, Id be miserable." "Better miserable than a smudge under KilJaedens hoof!" "Better a smudge than being closed up with you for another ten centuries!" "Oh, dont give me that talk! Last night you admitted you missed me," she snarled. "I was half dead. Whatever I said then is meaningless." She made a disgusted noise. "If I mean nothing to you then why not kill me and be done with it?" "Simple, Warden. Revenge. Youre going to experience what I did." She leaned in closer, lowering her voice. "Everything?" He paused, studying her lips inches from his own. "Everything." She put a hand on top of his, trapping it against one of the bars. "Might I remind you, however, that I was merely assigned to guard you. Your sentence was not my decision." Her fingers intertwined with his around the bar. He gave a single, humorless laugh. "As I recall, you wanted me executed on the spot." "We all make mistakes," she breathed, moving closer until their noses touched. "Like this." She kissed him fiercely, her free hand sliding around the back of his head to toy with his hair. He indulged her for several seconds before drawing away. "Youre completely raving mad, you know that?" "Probably, but at least Im in good company." "Thats about the closest thing to a compliment Ive ever gotten from you." "Dont get used to it." She grinned deviously and wound a strand of his hair around her finger. He stepped out of range, extracting his hand from hers. "What do you want, Maiev? You say you were only fulfilling your duty by trying to recapture me, but thats nonsense. Besides, Outland is just a tiny bit out of your jurisdiction. Not to mention the fact that my dear brother generously allowed me to go into exile, effectively releasing me from imprisonment under you or anyone else. Your duty as Warden terminated then and there, yet still you pursued me. If you hadnt followed me through the portal you would never have had to see me again. Instead you risked your life and the lives of your comradeswho I see are no longer with youto come here." Maiev paced while he spoke, moving with predatory grace. "Youre damn lucky I did, Betrayer, or youd be dead right now." "True enough. That still doesnt answer my question." She stopped pacing and faced him again with a furious glare. "I told you last night, you insufferable clod! I love you!" what? You really said that?" "Yes, I did. Are you deaf as well as blind?" I mean, I do, but I thought I was having some awful kind of hallucination." "I also hate you," she said with vehemence. "That I knew." He smirked, then grew serious again. "But, Maiev, you cant mean that. Look at me!" He flapped his wings once. "One of your stupider failings, I admit," she jeered. "Though your reckless lust for magical power is hardly a new development." " He shook his head in dismissal. "Actually love you?" she finished for him. "Yes! You hate me. You knowand are always quick to remind me ofall my faults. Youre devoted centuries of your life to making me miserable. " She grasped the bars tightly and leaned forward as far as she could. "Ive devoted centuries of my life to you, yes! Do you know how many times Shando Stormrage offered me other assignments? I refused every time until he stopped asking." "I assumed you were stuck down in that prison because you were so disagreeable that no one else wanted to work with you." "Oh, very funny, Illidan." She rolled her eyes. "My point is, Ive had plenty of opportunities to be rid of you and I havent. You said it yourself: I risked everything to follow you here. Would I do that if I didnt care for you at all?" She continued quickly, not giving him time to answer. "You also said yourself that I know you better than anyone. That should count for something. And I just saved your life. You know I hate you, but has it ever occurred to you that I might also love you just as passionately?" Illidan slowly shook his head, studying her intently through his blindfold. "By the Well, you are serious, arent you?" "After all weve been through together, is it really that impossible to believe?" He spread his arms and wings grandly. "So now what? Were back to the original question. What do you want? Do you expect me to let you out of this cell and into my bed? Do you expect me to trust you? To forgive you? To love you in return?" "Thats not an answer, either." Illidan gestured randomly, attempting to find the right words. "What difference does it make? Even if I loved youand Im not saying I doit isnt as if I have a long future ahead of me to do anything about it. KilJaeden wants me dead." "A lot of people want you dead, Illidan." "They dont have the power KilJaeden does." "So youre going to give up? The Illidan Stormrage I know doesnt roll over and surrender. He infiltrated the Burning Legion under the nose of Queen Azshara herself. He retained his arrogant, irritating attitude over ten thousand years of confinement. He drove Tichondrius from Felwood wielding powers no one else would dare to use. He nearly stopped the Lich King himself! The Illidan Stormrage I know would never stand around fretting over KilJaeden. Hed do anything and everything to save his own skin, and as many others as he could along the way, and damn the consequences. That is the Illidan I know and love." He crossed his arms on his chest and shifted his weight uncomfortably. "That may be, but this Illidan is sick and tired of it all. Tired of running. Tired of sacrificing myself only to be met by scorn and hatred instead of thanks and praise. I never wanted this. I would have been perfectly content to marry Tyrande and live in Suramar as the celebrated leader of the Moon Guard. I never wanted to rule over peoples and kingdoms as I do now. All Ive ever wanted was recognition for my talent and efforts, and for the woman I love to love me in return." His wistful look darkened. "Is that really so much to ask?" "But here I am, and I dont have any choice in the matter, so I might as well make the best of it. And if that means fighting KilJaeden until my last breath, then I will. The more demons I can take down before that happens, the better. If I cant be admired, I can be feared." Green light flared behind his blindfold as dark energy crackled around him. "All of Outland will tremble at my whim. Any who oppose me will face swift and certain doom!" "And as for you, Warden, youre going to stay here, enjoying my hospitality as I once enjoyed yours. Unlike you, I have more important things to do than hover around causing you aggravation, but Ive assigned Akama to watch over you. Wouldnt want you to feel neglected." He smirked. "Perhaps in another ten thousand years, if we both live that long, there will be time for us." He stalked off, leaving her to kick the barred door as angry tears burned her eyes.